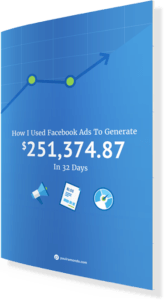 This site will make your Facebook Ads & Digital Marketing Funnels more efficient and cost effective. Even if you’ve had success with your digital marketing funnels and Facebook Ads in the past, the playing field is CONSTANTLY changing and evolving. If you’re not staying up to date with the latest platforms and best practices, then you WILL get left behind. I’d like to welcome you to my personal blog, a place where you’ll find a collection of Digital Marketing Funnels and Facebook Marketing strategies, tools, tips, tactics, hacks, how to’s and case studies which will help you drive more traffic, elevate engagement and amplify the conversion rates on your website. With this extensive collection of free resources, you’ll be covered when it comes to learning anything and everything about Conversion Funnel Marketing, Facebook Marketing, Instagram Marketing, Digital Marketing Tools & Resources, Digital Strategies, Snapchat Marketing, SEO and Email Marketing. Start building your first digital marketing funnel by signing up for me FREE Facebook Funnels 101 Video Course. I’m just your average 20-something year old dude from sunny Perth in Western Australia. At the age of 25, I decided to finally quit my day job and invest 100% of my time and resources pursuing a passion I’ve held since the age of six… And I’ve never been happier. My curiosity about people and my innate desire to question ‘why things catch on’ has followed me throughout my life. I remember being one of three students that were selected to give a speech on a topic of their choosing in seventh grade. I stood in front of my year group and delivered a speech on the topic “Fads and Crazes”. And whilst I didn’t know it then, at the age of 12, I literally gave a speech to bunch of Grade 7’s on marketing and social psychology and how it had affected all of us – from the crazes of marbles to Pokemon Cards, all the way through to Bey Blades – which was the current craze of choice at the time. If you haven’t picked this up by now… I was, and still am, a pretty big nerd haha. This curiosity and passion of mine has stayed with me throughout my entire life, and eventually led to me completing a Bachelor of Commerce at the University of Western Australia (and the University of Vermont) where I finished with a double major in Marketing and Financial Accounting and a double minor in Business Law and Economics. I have been fortunate enough to work with so many amazing people and brands in the years following my graduation. During this time, I wholeheartedly dedicated myself to developing and actioning advanced digital marketing funnels for national and global brands operating within Australia. These experiences allowed me to manage six-figure advertising budgets which drove significant growth in market share and bottom line revenue across a plethora of profit and not-for-profit industries for my clients. Despite working with and for so many amazing people and brands, I found I was never fully content working for someone else and building their dream. I knew I would never be able to fully pursue my passions in business, digital marketing and why things catch on to the extent I wanted to whilst I was working for someone else. So, at the age of 25, I quit my day job and invested 100% of my time and resources into teaching and helping other Marketers, Entrepreneurs and Startups how to Drive More Traffic, Elevate Engagement and Amplify Conversions Rates through the advanced digital marketing funnels I share through paulramondo.com. At the same time, I also launched my first company: RamondoMedia; a boutique digital studio that transforms awareness into evangelism through strategically executed digital experiences. “Over the past two years, I’ve witnessed just how much Paul lives, breathes and obsesses over the world of digital marketing and entrepreneurship as both an elite practitioner as well as a teacher and mentor to others. I’m here to help you dominate your digital marketing funnels and Facebook Ads. Whether you’re consuming my content on paulramondo.com or listening to me keynote a conference, it’s my goal to be your go-to resource for advanced digital marketing funnels that drive real, quantifiable returns on investment. 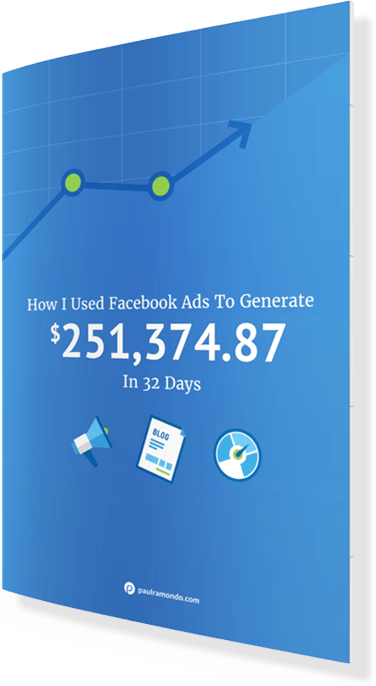 If you’d like to fast track your skills and knowledge of Facebook Ads & digital marketing funnels, scroll down to the ‘Free Case Study’ and click ‘Get Instant Access’. If there is ANYTHING I can do to assist you on your digital marketing journey, please don’t think twice about emailing me personally, you can contact me here. I really do read and reply to every email.